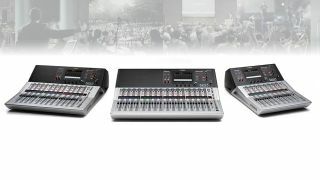 Yamaha has released a firmware update for the company’s TF series digital mixers with TouchFlow Operation, bringing with it expanded audio networking capability. The company has also released a version 4.1 update for its CL and QL digital consoles, adding new Dante functionality including support for the AES67 interoperability that allows communication with Ravenna, Q-LAN, Livewire, and other audio networks for improved system expandability. The new firmware for the TF Series—version 3.1—allows the consoles and the recently released TF-RACK equipped with an NY64-D Dante interface card to connect to audio networks, such as Ravenna, that support the AES67 audio-over-IP interoperability standard. With this new firmware update, AES67 compatibility will allow Dante to communicate with a variety of other AES67-compatible audio networks for enhanced system flexibility. In addition to the expanded networking capability in the firmware update for the CL and QL series consoles, the number of supported Shure Wireless Receivers has also increased. Version 4.0 provided support for the ULXD4D and ULXD4Q. Version 4.1 additionally supports non-Dante devices including the AXT400, QLXD4, and ULXD4. Control and monitoring are supported for all devices, plus transmitter gain control for the AXT400. Yamaha CL and QL 4.1 marks the fourth stage the Yamaha and Shure collaboration since 2013. Other new features in Yamaha CL and QL 4.1 include one-operation EQ type selection, improved RTA visibility, patch window effect type, and channel name displays. Mounting and patching of the Audinate Dante-MY16-AUD2 Mini-YGDAI card is also supported.